Ladies and gentlemen, allow me to introduce to you one of the easiest and yummiest desserts ever. The Lazy Cake Cookies. Or the Lazy Cookie Cake. Whichevs. It’s like a really thick, soft cookie! I don’t bake desserts all too often. It’s usually only for special occasions like birthdays or holidays. If I baked desserts as frequently as I craved them, I’d be 300 pounds. Typically, since I only bake desserts for special occasions, I try to make those desserts special as well. For events like Valentine’s Day and anniversaries, I go all out on the chocolate decadence. As a result, a lot of my dessert recipes are…well…pretty involved. Mix together all ingredients and spread into a greased 9x13 pan. *This would be AWESOME with a scoop of vanilla ice cream on top! *One commenter said "I froze these and then a week later, defrosted them. They came out great with no loss of taste or texture!" so these should be good for freezing! *You can also use ANY flavor of cake mix and small candy to mix in, so be creative! Check out the comments below to see some awesome cake mix/topping combinations (for example: chocolate cake with chopped peanut butter cups or mint chips, spice cake with butterscotch chips, German chocolate cake with pecans and coconut shavings, one commenter made a s'mores cake with yellow cake mix, graham cracker pieces, chocolate chips, and marshmallows!) The possibilities are endless! It looks like a chocolate chip cookie – kind of like the big ones in the store that are decorated for birthdays (minus all the frosting). Looks yummy. It looks delicious and easy. I can not wait to make these!! Making my list and heading to the store!!! I used Betty Crocker white cake mix and this baked beautifully but it has an almost bitter after taste. I followed the recipe exactly so I’m not sure what went wrong. I’ve made these many times and they were delicious every time. Thanks for commenting, Sheri! Glad you liked them! maybe it’s because you used a white cake mix in place of the yellow cake mix. I used a white cake mix and dark chocolate chips and mine tasted great! Etc get a bitter taste when they are too old. That’s the taste of the flour slowly becoming rancid. Haha you’re right they look almost the same! LOL My bench looks the same as well – must all have the same good taste!! I am going to make this today, I dont expect it will stay in the pan for long. Good taste indeed! Hope you enjoy the dessert, Louise! this lazy cookie cake (or Lake Cake Cookies as you called them) sound fantabulous! It’s making me crave chocolate chip RIGHT NOW!! Haha sometimes it’s best to just give in to that craving! Go make these and your sweet tooth will definitely be satisfied! Oh I bet the gumdrops will look really pretty! The colors will be so fitting for springtime! Thanks Tina! It’s definitely a crowd pleaser! I am using 1cup of mini chocolate chips and 1cup of peanut butter chips. They are in the oven right now. I’ll let you know how good they will be!! Peanut butter and chocolate is bound to be delicious! They were Awesome, making them right now adding heath chips too!! Hope you love them, Cindy! Tried this today and its a keeper! Thanks. Thanks Mary, glad you liked it! I tried this recipe last night and it turned out great! I did need to a 1/4 cup of water…. I believe this is because I had a larger cake mix. I topped it off with a scoop of ice cream, chocolate sauce, Carmel sauce, and walnuts. Better than a restaurant desert! Oh man, that sounds divine! Thanks for commenting! This sounds really fantastic, however, using the cake mix do you add the liquid as on the cake mix box or no? No need to add any liquid as listed on the cake box. Just the ingredients above is all you need! Could this be made with strawberry cake mix or chocolate cake mix? Also, have you tried it with only real butter or would margarine work as well? Oh girl, I always use margarine! So go ahead and save yourself some calories! As for the other flavors of cake mix, I have not tried them. It makes sense that it would still turn out well though. If you try it, please let us know how it is! We tried it with Strawberry cake mix. Didn’t turn out quite as good. Oh really? That’s a bummer. I wonder if it’s not the same as other mixes? Thanks for sharing! i have tried it with chocolate cake mix and used white chocolate chips and it was awesome. I put it in a heart shaped pan for valentine’s day. You could definitely add peanut butter chips or Reese’s Pieces! As for actual peanut butter, I’m not really sure whether or not it would work because I haven’t tried it. If you give it a shot, let us know how it turns out! I made it with Chocolate cake mix and it was good! Thought about doing white chocolate chips after I had already added the chocolate chips. Will try next time. Super easy! I also was able to cut mine into 24 and they are still a decent size. Thanks for sharing. Awesome! I love hearing everyone’s variations with different flavor cake mixes! Thanks for sharing! I bet Chocolate cake mix with the white chocolate chips would be good to!!! I’ll let you know when I get that “project” done! lol Right now I do have the yellow cake mix and M&M’s… so thats what I will use this time, also will add some chopped pecans to, because I always put them in my cookies. Thanks for this recipe! Oh that sounds amazing! Yes, please tell us how it turns out! Nice easy recipe. For years my grandchildren have been making many variations of this recipe when they visit me. For more ideas check out The Cake Mix Doctor by Anne Byrn, copyright 1999. The Duncan Hines website also has quite a few recipes for cookies using a cake mix. Thanks Louise. I love creative cake mix recipes. I made these a couple days ago and they turned out dry. Do you have any suggestions? I followed the recipe but I’m still unsure as to what may have happened. Hmmm I’m not sure what happened. Maybe it was just overcooked a little? I would try reducing the baking time to see if that helps. Good observation Diane! Thanks for the tip! Hope yours turns out great! OK, just put these in the oven. My daughters fifth grade teacher made them for her class and she said they were great, so I just had her make a batch!! Can’t wait to try them. I have triplets plus two older kids so easy and simple is GOOD! That’s so nice of your daughter’s teacher to bring them homemade treats! Hope your whole family loves them! Those look delicious! I think I will give them a try tonight. One question, did you use yellow or white cake mix in the picture above? I used yellow cake. I thought it might resemble a cookie more so than white cake. I’ve never tried the white though so I’m no sure if it looks any different. I have made these several times before and have turned out delish!!! I have also made them with chocolate cake mix and white chocolate chips and it was still very good! However it was not as soft as when I used to white or yellow cake mix!! But it was still yummy either way! 🙂 Happy Baking! Awesome! Thanks so much for the feedback Jamie! Glad you’ve enjoyed them! Wonderful! Hope your sister loves it! Mine are cool I on my counter right now. They seem a bit gooey in the center so I hope they weren’t under cooked!! (They were in the oven about 22 minutes) Next time I think I will use chocolate cake mix and a mixture of chocolate and peanut butter chips. Oh my goodness that sounds amazing! Hope you like them! Wow I definitely haven’t tried that many variations, but I’ll try to experiment more like you have. I’ve done several cake flavors and all were good. My latest is a dark chocolate cake mix, chunk chocolate pieces and ounce of Amaretto. Yummy! You’re so much more creative than I am! I love hearing everyone’s flavor combos! These are delicious. I made them for an event and everyone loved them! Thanks Rylee! Glad everyone enjoyed them! I’m on a diabetic diet as I am hypoglycemic and I think I am going to try this with a Sugarfree cake mix. It is sweetened with Splenda and makes a delicious chocolate cake….Pillsbury is the brand. I have some sugar free chocolate chips and may try some pecans or slivered almonds in it! Sugarfree vanilla ice cream sounds good on top of it! Have you heard of anyone trying it this way? Thank you so much for the recipe….I’m anxious to try it! Hi Karen! I actually haven’t gotten any feedback from anyone else who has tried it that way. But if it makes a delicious cake, it seems like it should make delicious cake cookies too! Let us know how it turns out! I made it with the Sugarfree Pillsberry cake mix and Sugarfree chocolate chips and it was so delicious! It was rich! I think this weekend I will make it with only a cup of the chocolate chips and use a cup of chopped pecans. 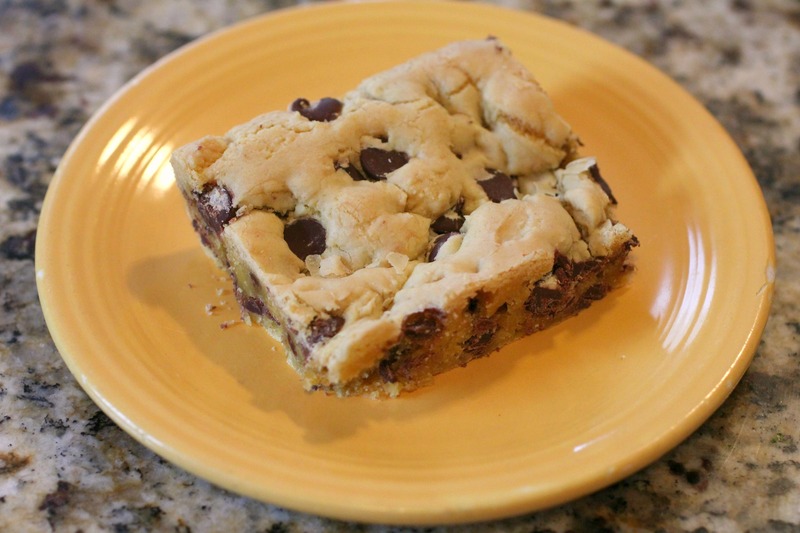 It was like a chocolate chip brownie ….only Sugarfree and didn’t effect my sugar. Even my husband loved them and doesn’t have to watch his sugar! Thank you so much for this recipe!! I used spice cake mix and butterscotch chips. They are great for the fall. Next time I’m adding chopped pecans . ooooo that does sound perfect for fall! Great idea! Wonder if you can replace a nut butter for the butter to make more of a peanut butter cookie. I just made these for a card game with chocolate cake and peanut butter chips… I made the regular ones and everyone loved them. These look delicious.. I have made these with white cake mix with cinnamon chips and put vanilla icing on top. Delish!!! Taste just like a sweet roll. Mmmm Jacie that does sound good! Great idea! Anything I can use other than butter? Oil? Kat, I don’t know whether or not oil would be a good substitute for butter in this recipe since I’ve never tried it. But if you try it, please let us know how it turns out! These look easy and yummy..i was looking for a bar cookie to put into Christmas gifts and think this one will work great, maybe with the holiday version of chocolate chips 🙂 Thank you! That’s a great idea! These are perfect for small Christmas gifts. I always do these with red velvet cake mix and then frost them with cream cheese frosting . Everyone loves them! Oh my goodness I will definitely have to try that! Thanks for sharing! Can you use margarine instead of butter? ? Sure!That’s actually what I used. Just put them in the oven and my kids can’t wait! Someone in our office brought these in today and OMG! They were sooooooooooo good! Do you know approx. how many calories are in one? Hi Stacey. Unfortunately I don’t know how many calories are in them! Sorry! Has anyone tried this at high altitude? I’m in the mountains and am trying to figure out what modifications I should make. Two years later…I just made them at high altitude (mile high) and they were delicious! No adjustments for altitude. I made this for a gathering because of the rave reviews. I thought it would be hard to get raves with such a simple recipe, but I did! I got a call asking for the recipe. One thing- I baked it a bit longer until light golden. The surface was a bit pock-marked looking. I mixed some more mini chocolate chips with coconut and sprinkled it on top, then let it cool. They really loved them and they were super easy. Thanks Karen! Glad they were a hit! I have made these, & I’m sure you will be pleased with them. Every year for my daughter’s birthday, she wants a cookie cake. After I made this, she wants me to fix this for her birthday from now on! I don’t blame her! Every Valentine’s Day, I bake my husband a decadent, fancy dessert. I asked him if he had any preference as to what I make him these year and he said, “That cookie thing with the word ‘lazy’ in the name” Haha so much for fancy and decadent! Thanks Lillian! Glad you liked it. I’ve made these once before with Valentine M&M’s, devil’s food cake mix, and milk chocolate chips…like a triple chocolate brownie! I also just made some today using milk chocolate chips, chocolate fudge cake mix, mini marshmallows and a bit of coconut, and used 1 stick of butter. A friend of mine who is teaching a coworker how to cook today will be bringing samples of these to her as well, and I’ll be giving him a copy of the recipe to show her. It’s a great recipe that can be customized any way you want…I’m thinking red velvet with white chips, dark chocolate with mint chips or peppermint patties, or even spice with pumpkin spice or cinnamon chips! These are so good and a great recipe for anyone…even kids could make these. Those are all awesome ideas Carla! I love your creative combos! Thanks for sharing. Super easy to make and delicious! You can add in any candies, chocolate or peanut butter chips and even crushed andies mints! We use chocolate chunks, white chocolate chips and make peanut butter nutella frosting for the top. To die for with that frosting 🙂 Promise! Mel, that sounds amazing! Thanks for the ideas! Thanks, Shaniqua! Glad you liked it! This is SO easy – I made with white chocolate chips and white cake mix…my husband said they were the “best blondies he had ever eatern”. Shhhh…don’t tell him how easy this was! I made this “cake” for a Friday night happy hour and it was a hit. I am looking forward to trying these others suggestions too. I do have a question. My chocolate chips melted because of the melted butter. Do you put the chips in last instead? Thanks for the great recipe! Hmmm I’ve never had that issue, and I usually just dump it all in, one ingredient after the other. You could let your melted butter cool a little bit before mixing to make sure the chips don’t melt. Hope that helps! Thanks Lindsay! I will try that this weekend. Do you make the cake mix then add other ingredients? Nope! There’s no need for the oil and other ingredients called for on the cake box. Just mix together the ingredients listed, there’s no need for a certain order. I’ve made this twice just using the cake powder, eggs, butter. It’s been very thick, can hardly spread in a pan. So should I be using the oil and whatever else the cake MIX calls for? The dough is definitely super thick when you’re spreading in the pan. Sometimes I just use my hands instead of a spatula to get it done easier. No need to use the oil or anything else though, as it should all turn out deliciously once it’s baked! Hi Helen. To be honest I thought all boxed cake mixes had the same amount in them, but after seeing your question I thought I’d google it. It turns out that boxed caked mixes range from 15.25 oz to 18.25 oz! I never knew. But to answer you question, I really think any box within that range would provide excellent results. You don’t need to make the cake mix as directed on the box (with eggs, oil, etc). Just simply pour the powder into a bowl and mix with the other ingredients in the recipe. I am planning on trying to make these tonight but with gluten free cake mix and applesauce as a substitute for the butter (my friend has gluten and dairy allergies). Do you think this will work or what would you recommend? Hi Maggie, I have heard of using applesauce as a replacement for butter, and I think it should work fine with gluten free cake mix. Let us know how it turned out! Made these this am for a church concert – PERFECT! Followed the recipe exactly. I’m not a baker, but I am now! Thanks Joan! Glad you liked them! Baking is easy with “cheat” recipe like this one :), and there is nothing wrong with that! Mmmm peanut butter does sound good in these! Thanks for the suggestion. Hi! I used my own homemade make ahead “cake mix” from a recipe on food.com. It’s just 2 cups flour, 1.25 cup sugar, 2.5 teaspoons baking powder, and 1/2 cup shortening. Then you store it in a ziploc. Anyway, I followed your instructions, but I used a glass 9×13 dish to bake it in. After 20 minutes It was still gooey. Is it the glass pan? Or maybe my DIY cake mix? how long do you let them cool before cutting? Maybe they would have firmed up. I baked it 20 extra minutes and it was perfect. It must be a combo oy cake mix and glass dish. They are fantastic though! Glad it turned out well! Thanks for the cake mix recipe. Sounds great! They were all so delicious and so easy to make. I have a ton more ideas and plan to make more for Thanksgiving then again to give as gifts for Christmas. The everything bars had pecans in them too. April, I LOVE all these creative combinations! Thanks so much for sharing! Did you make any other changes to the recipe other than what toppings you added in? No, I followed the recipe just mixed up the flavors and add-ins. Awesome! Thanks for sharing! I’m definitely going to try out some of these variations you listed! Made them with a bag of Heath bar chips, a big hit! Oh I bet that was good! Making these now. Is there a trick to spreading it in the pan without it sticking to spatula or hand? Using your hands is probably easier. Rub some flour on your hands to reduce sticking. I used butter pecan cake mix and it was delicious!!!!! Oh that sounds interesting! My husband loves butter pecan so I might try that out! My son loves these even more with some butterscotch chips in then. Right now I have some in the oven. Didn’t have chocolate chips so used the butterscotch. Love how easy and tasty they are. I have gotten my mom into making these as well. Thanks Carrie! I’ll definitely have to try it with the butterscotch chips…my husband loves those! I made them this weekend with strawberry cake mix and dark chocolate chips. I also added some fudge frosting to the top. Really good. Tonight for a coworkers birthday, I’m making chocolate with chocolate chips, and I may add some peanut butter as well. Ooo I really like the combo of strawberry and dark chocolate. I’ll definitely give that a try! Thanks for sharing! Hi Nazia. Mine has never really turned out cakey. It’s not exactly the same texture as a cookie cake, but it’s definitely not crumbly like cake either. Sorry it didn’t turn out how you were expecting! Ahem. Made a couple of changes…best dessert in a long time? I think yes. To the melted butter I added a dash of vanilla and about a tablespoon of instant coffee granules. I used a devil’s food cake mix, and used some espresso chips I had leftover from the holidays…served them with vanilla bean ice cream and dark chocolate ganache…HEAVENLY. Highly recommend if you love coffee like I do. Thanks for the suggestion, Dani! My husband LOVES coffee so I bet he would devour this. Hope you like it Stevie! Does size of pan matter? I’m a bit late to this Cake Cookie party, but so happy I found your site are recipe! Have you ever made this ahead of time and frozen it, to be used a few weeks later? If so, how well does it freeze? Does it lose any flavor or texture after freezing? I plan to cool it after baking, wrap it first in plastic wrap, then in foil, and putting it in a Ziploc baggie and freezing it like that. Thank you so much! Hi Jess. I haven’t ever frozen it, but I like your idea! If you give it a try, please let us know how it turns out! I did freeze these and then a week later, defrosted them. They came out great with no loss of taste or tenure! Thanks for the update, Jess! This is great to know! I’ll add this note to the post. Do I only put the ingredients that you have listed or do I need to add the stuff on the back of the cake box too?? Only the ingredients listed. You don’t need the other ingredients listed on the cake mix box. My family and friends beg for these cookies!! We love them!! Making some tonight for friends that are coming over!! Oh my goodness that sounds awesome! I bet it was divine! Just wanted to say thank you for this awesome recipe. I have made these about a half dozen times now. I love this recipe after a long, hard week at work. Such a nice, easy treat! I used yellow cake and mini m&m candies, but can’t wait to try some of the other varieties in the comments. Thanks again! Hi Jenni! So glad this recipe can bring you some joy after a tough week of work! I totally know the feeling. Have fun experimenting with other variations! I added toasted pecans with it and Trader Joes vanilla bourbon cake mix because it was all I had in the pantry and they came out so good!! Oh that sounds so unique! Thanks for sharing, Jay! Can I use regular size chocolate chips? You sure can! I’ve done that several times. Can these be done in round pans to look like a giant cookie? Would I change the time or temp? Hi Lyndsay. I think you could use 2 9-inch round pans instead of 1 9×13. However, this dough is sticky, so it won’t really slide out of the pan and onto a plate like “giant cookie.” You could use springform pans instead though if you’re going for that look. I think using round pans would require you to reduce the cooking time, but I’m not sure by how much. Just be sure to keep an eye on it! Let us know how it turns out. Wanted to update you! They turned out amazing as cookie cakes! I used the Jiffy pizza pans (di(disposable) . I’ve already had requests for more 🙂 would love to share the photos of them if you care to see! Thanks so much for this recipe! Awesome! I’m so glad they turned out well! And I’d like to see the photos too! You can email them to me at normalcookingblog@gmail.com. I will make these soon. My grandchildren will love them. I’m always looking for easy, delicious recipes to fix for the family. I was just wondering if you can clarify that when you dump all the ingredients together you dump the cake mix as is and do not follow the cake mix directions? That’s correct! You don’t need to follow the cake mix directions, and you don’t need the other ingredients listed on the cake box (like oil,) just the ones listed in the recipe. I’ve made these with milk chocolate cake mix, m&m’s, and milk chocolate chips, white cake with peppermint, devil’s food with Andes mint chips, yellow with milk chocolate and coconut (like Samoa cookies), devil’s food with chocolate cherry chips, and yellow with mini semisweet chocolate chips and coconut. They’ve never failed me yet! I bet red velvet with white chips would be amazing! Wow, I love your creativity! I need to experiment with other combinations too! Looks amazing, keen to try it out. What is the weight of the cake mix? I believe it’s 18.25 oz. However, I’ve made this several times and just grabbed any ol’ cake mix without looking at the ounces, so I doubt it would make a difference if you got a mix that’s 16.25 oz. I made these fab bars for a Labor Day cookout and they came out Delish! Thanks god such a easy and simple recipe. Will make again! Thanks Jessica! So glad you liked them! Do you follow the cake box ingredients as well? Nope! Just follow the ingredients as written in the recipe and ignore what’s on the box. Hope you like it! for the cake mix, do you have to mix it first or just pour in the cake mix? Just pour in the cake mix, you don’t need to prepare it first. I make these all the time and they are so yummy. Today I added in a box white chocolate pudding powder and it made the cookies more moist. They were a hit! Thanks for the easy peasy, my go-to recipe! Kayla, I like the way you think! I’ve used pudding power before when baking cookies, but it never occurred to me to combine it with the cake mix in this recipe! Thanks for sharing! I made these last week and they were, easy, quick, no mess and my grandkids loved them… so did I Plan on making them next week with the chocolate cake mix. I know they will be so good. So glad you and the grandkids enjoyed them! Thanks for commenting! This Looks Great…Do You Think It Will Ship Well? Hey Debbie, I honestly have no idea! It’s basically the same as cookies, just thicker. So if cookies ship well, then my assumption is yes these would be fine. Hope that helps! I have made these many times with many different cake mix flavors and combos of chips ad nuts. I have found that they make up best with the Duncan Hines cake mixes. They are a hit at work and so easy! Thanks for the tip, Ms. O! Glad you’ve enjoyed the recipe! I have made these with several different combinations.. My favorite is lemon cake mix with white chocolate chips. Ohhhh I haven’t tried that one! Thanks for the suggestion Sheri! Oh my; looking for something easy tonight and gave these a whirl. Tasty! Thank you…will definitely be trying a few different combos on this one. I have a batch in the oven with chopped Halloween candy. How resourceful of you, Stone! That sounds delicious! I made this with German chocolate cake mix and put coconut, caramel, and pecans in it. It turned out fantastic. What I like about this recipe are the varieties you can make with different mixes and different add-ins. I love your blog…the recipes are delicious, easy and NORMAL. thanks so much. Thanks so much Michele! I’m so glad you’ve found my blog to be helpful. Thank you for the sweet comment! I used red velvet cake mix and white choc chips. was delish. Sounds so good… I bought everything to make for an upcoming Christmas Party. I’m just changing it up a bit and I’m adding Peanut M&M’s. Hope this works! Made these for a cookie swap. They were a big hit. I baked them a few minutes longer than the recipe called for. Delicious! Glade they were a hit, Donna! Thanks for sharing! Girl! My daughter came home on Friday afternoon and told me she had a cookie exchange in the morning. She needed 8 dozen cookies… O…. M…. G. I am NOT a baker. Your recipe/idea worked like a charm! Thank you. You’re very welcome! This is definitely the recipe for lots of cookies in a pinch. Glad it worked for you! 2cnd time making them… Yummy!! Made these on a whim (and a pregnancy craving). They were so simple and delicious! I used a butter cake mix and chocolate chips. Great flavor and texture. The best compliment came from the 5-year old who told me no fewer than 5 times today that she wants this for her birthday cake. Awesome! Thank you! Thanks Laura! Glad to know this recipe satisfied your pregnancy craving and your 5 year old :-). A funfetti cake mix would be awesome for a birthday cake! I call myself a lazy cook because I shorten every step possible and the amount of cookies this makes lets me have a few extra (providing I hide them in time). Thanks much for the idea. Thanks Kathy! It’s pretty great to find a recipe that lets us be lazy AND also get lots of compliments from people thinking we slaved away in the kitchen :). So glad you’ve enjoyed these cookies! Thanks Tina! I recently did something very similar to what you are describing and used this recipe from Life Love and Sugar. It was AMAZING! I will be posting about it on Normal Cooking soon! Whatever you do, I’m sure your son’s birthday cake will be DELICIOUS! Just popped my attempt in the oven. I used pillsbury butter cake and added a ripe banana. Smells delicious! Oh that’s a new combination! Hope it’s wonderful! Thanks Stuart! So glad you and your coworkers enjoyed them! Oh how sweet! And congrats! Hi Julia, it’s not really moist in the way that a cake is moist. It’s more like the texture of a soft cookie. I was searching “how to make a chocolate cake?”. Recently, I’ve seen your article and read it. You’ve explained very good. I really liked it. So, keep up the good work. I am a 56-yo male & have made the drop version of cake-mix cookies with my sisters since I was in 4th grade. A few years ago I made it easier by using a melon-ball sized ice cream scoop for the batter. I was glad to find a bar-cookie version that’s even easier! Last weekend I made 2 batches: devil’s food cake with cinnamon chips & spice cake with chocolate chips. Both were heaven & my 86-yo chocoholic mother was delighted with 2 choices! Thanks for sharing, Rich! So glad you enjoyed them! I have found the best box mix is the Duncan Hines Golden Butter – amazing!!! And truthfully I only use a little over 1 cup of chips etc. It is plenty! Everyone loves these. I’ll have to try that mix! I used white cake mix and added vanilla and busted up snickers baking pieces. Everyone loved them. i tried a variation of this recipe with pumpkin chips bought from aldi and spice cake mix. it turned out great. I haven’t tried that, but I hope someone has the answer! Looks so easy! Cannot wait to try. I’m making these with butter pecan cake mix, a swirl of Nutella, and chocolate chips. They are baking now. Ooooo I love the idea of Nutella swirl!Thanks for sharing! So glad it was a hit! I’ve done the same Christmas version you mentioned, and it was delicious! LOVE this recipe…I thought of adding some crushed candy cane to my mixture for a Christmas party! Ohhh that sounds tasty and festive! I orighinally found this recipe on Pinterest. Its a great and easy recipe to use for beginners. Or to use for a family evening filled with lots of laughs, movies, and of course cooking. I have made this recipe a dozen of times and with each time, i usually try adding different things. Tonight i made this recipe and used pecans and chocolate chips. It was fantastic and all the bboys in my home wanted seconds. For a lighter recipe you can cut the chocolates and add nuts as well as cutting the butter and add a can of diet sprite or coke.